Isuzu 117 Coupe with the DOHC engine and automatic transmission. This car is in good condition – was purchased as a runner in Japan and I drove it in Nagoya however between Japan and the USA, seems to have a problem with main relay and fuel pump. Should be a straightforward project however one that I have not had time to get to – good price for someone handy. From Wikipedia – The Isuzu 117 Coupé is a compact Gran Turismo type 2-door fastback coupé which was produced by the Japanese automobile manufacturer Isuzu between 1968 and 1981. 117 was a codename for a common development program of Isuzu mid-size cars, involving a coupé, sedan and station wagon. The latter two eventually became the Isuzu Florian, but the coupe kept the original name, and both models shared mechanicals, including the complete FR layout chassis with recirculating ball steering. The 117 Coupé was styled by the famous Giorgetto Giugiaro, being one of the first Japanese cars designed by an Italian stylist. It was among the first Japanese cars with a DOHC engine, and the first with electronic fuel injection. The 117 can be regarded as the world’s first sports car to be available with a diesel engine. 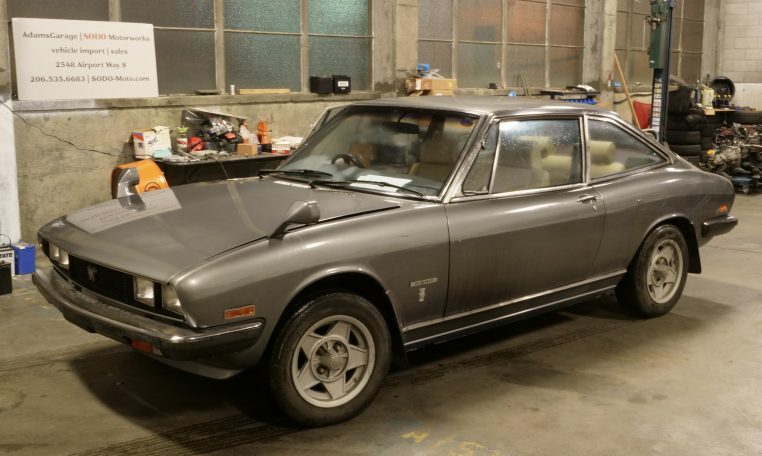 It was quite an exclusive vehicle during its lifetime, and is a rare collectible now, but thanks to its unusually long lifecycle, Isuzu manufactured 86,192 units. The 117 Coupé was replaced by the Isuzu Piazza in the Isuzu lineup.